Tagged with " 3D printing market"
Last year, market revenue from the 3D printing market rose to $3.3 billion with just under 133,000 3D printers shipped to customers worldwide. Now market analyst, Canalys estimates that the global market for 3D printers, materials and services will reach a staggering $20.2 billion by 2019. 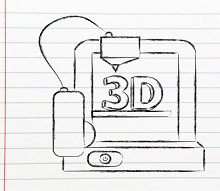 “India 3D Printer Market (2015-2021)” is a report from 6Wresearch covering the 3D printer market, and it’s broken down by technology, application, end uses and region. It’s a report that offers estimates and forecasts on technologies like Fused Deposition Modeling (FDM), Selective Laser Sintering (SLS), Stereolithography (SLA), Polyjet and Multi-Jet Modeling (MJM) systems, which breaks down the market into different applications such as electronics and consumer goods, automotive, medical, industrial, aerospace and military, educational and architectural in the private, commercial and industrial spheres. If you’re wondering about the health of the market for 3D printers and 3D printing technology, put your thoughts at ease. Market research firm Canalys says almost 133,000 3D printers were shipped around the world during 2014, and that represents a whopping 68% increase over the calendar year 2013. So what really is the value of the 3D printing industry? While everyone agrees that 3D printing technology is ‘hot’ right now and that encouraging growth signs are everywhere, it is remarkably difficult to put a price tag on all that. As you might know, various international research institutes have devoted time and money finding out – such as Gartner, PwC, Canalys, IDC and Wohlers – and their results are encouraging. As fierce competition heats up on the consumer side of the 3D printer market, the major players within the industry continue their torrid rate of expansion by signing new distribution deals, raising research and development budgets, and hiring new talent. It’s always reaffirming when a large, well known corporation decides to enter a relatively new market. Back in October, printing and electronics hardware company, Hewlett Packard, announced that they would be releasing a new 3D printing technology in 2016. Way back in May, we did a story in which we used Google Trends to diagnose the growth rates within the 3D printing market. Since that time the market has certainly continued its rapid rate of growth. Here we are, seven months after our initial report, and I’ve decided to use Google Trends once again, this time to dive a bit deeper into the 3D printing industry. 2014 has been a banner year for the 3D printing industry. Major corporations like Autodesk and HP have entered the space, while consumers have been the beneficiaries of major price competition, meaning affordable consumer-level 3D printers for all. Despite all this, Gartner estimated back in October that a total of only 108,151 3D printers would sell in 2014. This is just a fraction of the market’s potential going forward. Big companies face increasing pressure from lesser vendors as patents expire. How will they survive? The 3D printing space has incredible promise. Growth rates within both the consumer and manufacturing sides of the market have been quite staggering these past couple of years. Where there is growth, there is a keen interest among investors to follow the money. In a nine month period, from around March of 2013 until the very start of this year, we saw stocks within the 3D printing space soar, some close to 300%.